This document begins with a paean to Saint Francis, which celebrates the natural world as a revelation of God rather than as a set of resources to loot and exploit and deplete. The key words here are ‘family,’ ‘sustainable’ and ‘development.” Francis is making it clear that humanity is all one family and that he is not advocating any sort of Luddism or ecological escapism. He wants development– scientific advance and economic improvement. But he wants it to be accomplished in a sustainable manner. Sustainability means that resources aren’t permanently depleted– resources like water and fuel. Francis considers the challenge of acting to prevent debilitating climate change. He warns that we cannot sit back and just hope for a technological fix. New technologies are key, of course. But he points to powerful opposition and also to public apathy. The opposition can interfere with technology, as with those states, like Florida, that levy punitive taxes or fees on solar panels in an attempt to keep people hooked on fossil fuels. The answer to both obstructionism (stemming from greed) and apathy is solidarity, is standing together across the social categories. 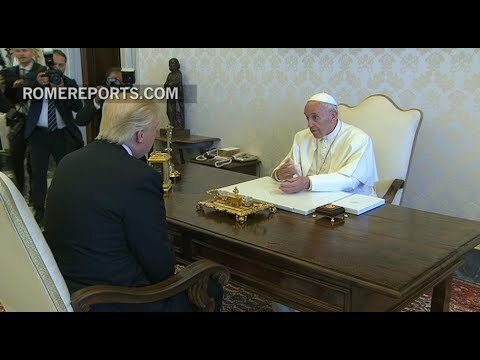 When he gave Trump this work, Pope Francis was aware that Trump is a major climate obstructionist. He is nevertheless appealing for human solidarity in the face of a dire threat. Believers don’t give up on people. Millions of people, the Pope says, are killed every year by air pollution. The seas are in danger of a mass die-off of marine life because of acidification. An ecology is a dense network of inter-relationships, he underlines. Trying to address one problem (e.g. transportation emissions) may only create others if a broad, holistic approach is not taken. Electric cars, e.g., are only able substantially to reduce emissions if the power plants that provide their electricity are not run on coal. Pope Francis notes the near unanimity of scientists on the danger of human-made climate change. Extreme weather and sea level rise are among the dangers. We have to stop emitting so much carbon dioxide, and that will require changes in our styles of life. But above all it will require a conscience and dedication and solidarity. Trump is a little unlikely to get it. But the point of publicly bestowing on him this gift is that the Pope hopes the rest of us will.